Photo: Jacob Weber House, ca. 1863, 825 Oak Street, Wisconsin Dells, WI. Listed on the National Register of Historic Places in 1978. Photograph by User:Jeff the quiet, 2012, via Wikimedia Commons (creativecommons.org/publicdomain/zero/1.0/deed.en), accessed February, 2013. 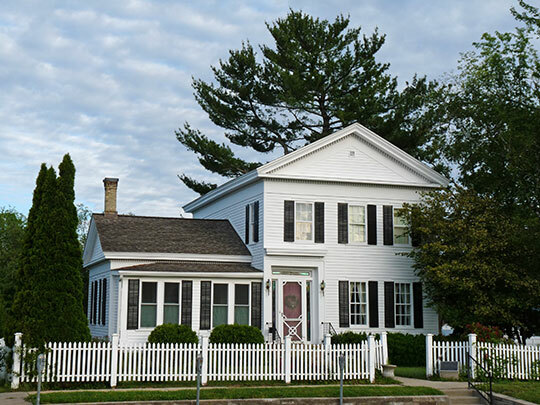 Columbia County administrative offices are located at 400 DeWitt Street, Portage, WI 53901; phone: 608-742-9841. The first settler in what is now Columbia County was Wallace Rowan. On June 6, 1836, he entered, at the Green Bay Land Office, the northeast quarter of the southeast quarter of Section 34, Township 11 north, of Range 9 east, in what is now the Town of Dekorra, adjoining the village of Poynette. This was the first land entered in the county, but it was then Brown County in Michigan Territory; afterward Brown County, Wisconsin Territory; subsequently Portage County, Wisconsin Territory; then Columbia County, Wisconsin Territory; finally, Columbia County, State of Wisconsin. Rowan moved from Dane County to a 40 acre homestead. His house was a double log tenement, built for the purpose of trafficking with the Indians, and as a house of entertainment for travelers. It was on the military road that ran from Prairie du Chien by the way of Fort Winnebago, to Fort Howard. Rowan also kept a trading house at Portage City, in 1838. In 1840, with a man named Wood, he made a claim on the Baraboo River. They built a saw mill just at the upper end of Baraboo Village. Columbia County was created by act of the Territorial Legislature, comprised of land taken from Portage County. An election was held in April of 1846 to vote for the location of the count seat. The following places were voted, each receiving the votes indicated: Columbus, 97; Winnebago Portage, 49; Duck Creek, 47; Dekorra, 33; Dyers, 10; Van Duer, 3. The vote was found defective since no one place received a majority. The county seat was temporarily located at Wyocena. The History of Columbia County, Wisconsin, Western Historical Company, 1880, digicoll.library.wisc.edu, accessed July, 2011.